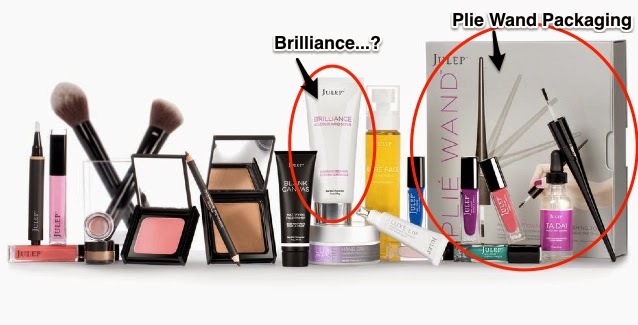 Julep was featured in an article on Techcrunch today with a photo depicting the Plie Wand Packaging and a new product we haven't yet seen. Could it be another product for the May Maven box along with the Plie Wand? All I can make out on the package is "Brilliance", the rest is too small to see. Maybe some kind of hand cream or scrub, which is why they've been seemingly trying to get rid of it in their mystery boxes. The Plie Wand packaging looks a little large, don't quite know how they plan to fit that in our May Maven boxes. Maybe they're going to use a new box shape for May only. Who knows, but there should only be the wand and the cap in the package, why it's so big is a mystery. Maybe it has a nice user guide for it. That would be nice. The julep plie wand seems a bit hokey but I guess I'm getting it automatically since I joined in January and haven't earned my skip yet. A user manual would be nice ;) !